The Retro Set mourns the loss of the great Robin Williams. He brought laughter to the world, and gave us all precious memories that will never be forgotten. The following is a collection of remembrances from staff on how Williams’ work touched us on a personal level. He filled our hearts with laughter, and here we say goodbye. Robin Williams created any number of indelible characters, but my favorite of his roles, by far, is his Genie from Walt Disney’s Aladdin (1992). To be honest, I didn’t always feel this way. For years, I disliked Williams’ performance, because I felt like the character was too much. Too crazy. Too distracting. Too hip to pop culture references that he had no business knowing, having been in a lamp for ten thousand years. In other words, too Robin Williams. And yet, after re-watching the movie last year (for the first time in a long while), I started seeing the character, and Williams’ performance, in a new light. 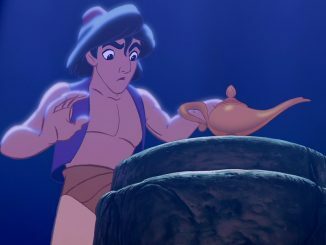 There’s an appealing sense of freedom to the Genie–odd, considering he spends most of the film as a slave to the lamp–because Williams injects his delivery of his lines with a purely exuberant spirit. His vocal acrobatics as the Genie were unprecedented. He deviated from the script, something that was practically unheard of, and in the process, he produced something joyous. Freewheeling, off-the-cuff, and endlessly inventive, Williams’ performance in Aladdin is nothing less than iconic. Yes, the Genie is almost too deliriously manic. But he also has a great deal of warmth and heart, like so many of the actor’s memorable characters. For when he was firing on all cylinders, few could toe the line between utter insanity and genuine feeling as adroitly as Robin Williams. My heart aches to know that his unique genius, his brilliant light, is now gone from this world. Two days later, my mother surprised me by taking me out to the movies after school. Our local movie theater was a total dive with three screens, and as far as I know, to this day it still has regular auditorium-style seating. The matinees cost 5 bucks for adults and I think 4 bucks for kids. Popcorn was probably a buck and a half. Mrs. Doubtfire was still in theaters (and still going strong—these were the halcyon days when a movie didn’t have to be a superhero franchise to last more than two weeks at the top of the boxoffice), and we had somehow managed to have missed seeing it when it came out over Thanksgiving. So my mother figured if anything would make me laugh, this would be it, which also meant it would help me to relax. She was right. We both laughed until it hurt, there in that nearly empty, smelly old auditorium, just the two of us, throwing our heads back in laughter. And on the same token, by the end, the pair of us were both teary-eyed. Williams took us from outrageous slapstick (“Don’t raaain on my paraaaade” still gets me) to tears of unabashed sentiment. He was so honest and sincere, he left us no choice but to go along with him. Mrs. Doubtfire isn’t what I’d call a great movie, and it’s not by a long shot my favorite of Williams’ roles (that title belongs to his tour-de-force performance in Christopher Nolan’s Insomnia) but it does illustrate the precious gift he had that very few comedians—or actors—possess. Only a handful have ever been able to so deftly, and with such searing honesty, engage their audience on that tender–and delicate– journey between pathos and pain. And to this day I thank him for making me laugh and cry on that January afternoon. The world has lost a white hot flame of talent, and a shining light of laughter. We will miss him because we loved him…and because in this fractured world, we need to laugh. I wasn’t a tremendous fan of Robin Williams in his more manic roles. I never cherished Aladdin; I found his cartoonish energy to be a mixture of exhausting and obnoxious. However, I appreciated that side of the performer because it gave him something to define himself against when he one upped other stars “who went dark” in the 2000s. While Denzel Washington made Training Day and Tom Cruise has always toyed with his screen persona in sporadic bursts, Williams made three ‘anti-Williams’ films in one year: Insomnia, Death to Smoochy, and One Hour Photo. The dark comedy Death to Smoochy has some moments, most of which are owed to the handful of interactions that Williams gets to play off of the helplessly happy-go-lucky Edward Norton, while One Hour Photo is an underappreciated slow burn. Yet, for me, Insomnia is both director Christopher Nolan’s most under-appreciated film and one of Williams’ best performances. Here, the beloved comedian plays a writer who has killed a young girl and is blackmailing the cop (Al Pacino) assigned to the case. Yet, its Williams’ calm delivery and rationality that make him both sympathetic and more menacing. Like Alfred Hitchcock’s work, we’re terrified by Williams because he isn’t that much different from us. And yet, without the manic Robin Williams, there would not be a star context for such a turn– no definition– and it would not have had the same effect. Like the rest of the world, I was completely shocked upon hearing the news of Robin Williams’ tragic death. You see, like most of my colleagues here at the Retro Set (and I’m sure a majority of our readers), I grew up watching Mr. Williams. 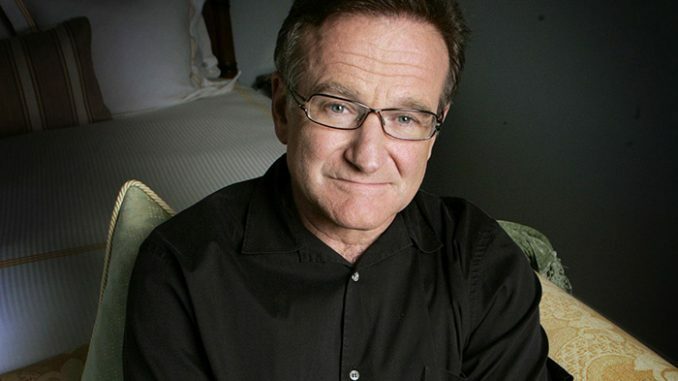 Whether it was reruns of Mork and Mindy on Nick at Night, or his performances in films such as Dead Poets Society, Dead Again, Awakenings, The Fisher King, Good Morning, Vietnam, What Dreams May Come, Insomnia, One Hour Photo, etc., there was always something unique he brought to each role. One of the critiques of Mr. Williams’ work and performance style is that he was almost too manic and hard to reign in. I think this is what made him unique, and when he was under the right direction, that manic style could be harnessed into a brilliant performance. Did he make some bad films with some less than stellar performances? Absolutely. But the same could be said for every actor working today, especially those with the “Academy-Award Winner” moniker, or curse, (depending on how you look at it) preceding their name. One thing that sets Robin Williams apart from other stand-up comedians-turned actors (who occasionally still dabble in stand-up), is that despite his reputation for very funny, but incredibly raunchy stand-up routines, is he somehow positioned himself as a star of family-friendly movies. The fact that an all-American family can trust Robin Williams to entertain their family and be just edgy enough, but not offensive, is a testament to his talent as an all-around entertainer. A family can sit down and watch Mrs. Doubtfire, Hook, or Jumanji and know it will be funny, sweet, and have a good message, but without the adult-rated humor. He successfully bridged the gap between adult and family humor and could easily go back and forth between the two. And when the kids are in bed, mom and dad can turn on one of Mr. Williams’ hilarious stand-up specials. Although he was a great actor, especially in darker roles that really played against type, the limitless boundaries of the stage and a lone mic were where he really excelled. In the summer of 2002, my husband Thomas and I were living in Lafayette, Indiana. Robin Williams had announced a sold-out nationwide tour and our sister city, West Lafayette, was one of the 26 stops. We were able to grab tickets for the sold-out show, but thought surely Williams would cancel at the last minute. After all, Lafayette/West Lafayette is a pretty small rural area. Nope. He came. And boy, did he ever put on a hell of a show. For about 2 1/2 hours, Williams ran from one end of the Elliot Hall of Music stage to the other, jumping up and down, using every possible muscle in his body and vocal chords. He employed a bottle full of water as a hilariously crude prop; his hairy arms (specifically the inside of his elbow) doubled as a part of the female anatomy; he made rather witty (and painfully true) observations how in a post-9/11 world we can’t take a pair of nail clippers on board a commercial aircraft. The entire audience, Thomas and myself included, couldn’t breathe for all the laughter. Had Williams gone on with his set for a minute more, I swear there would’ve been medics carting people off to the hospital for broken ribs. That manic, free-form, stream of consciousness personality that Williams put up as his public persona, was sometimes difficult to swallow in large chunks. But when he was was on that stage, entertaining a crowd, it was perfection. Farewell, Robin. Thank you for all the years you brought my family together to laugh and cry. You were a sweet, talented spirit, and no one will ever be able take your place. So much has been said about Williams already, it’s hard to find any necessity in adding to the conversation. But, I suppose there’s a kind of beauty in reading the people whose lives were touched and changed by this class act, or any performer or artist in general. For me, Robin Williams shaped my understanding of comedy: he was filthy, undoubtedly, but that edge was enticing, seductive. But his limberness in humor was utilized to perfection in even his more dramatic roles, such as One hour Photo and Insomnia. In those roles, his skill as a precise, but expressionistic artist is best revealed: he exhibits vulnerability, but calculates it in a manner that’s sympathetic and captivating. Robin Williams was a high wire act that the world couldn’t stop watching. I have so many memories of Robin Williams, and the loss is so great, it’s still difficult to organize them all. When I was growing up, he was the unfathomably fast comedian and improvisationalist. It was the first time I realized someone could successfully make stuff up as he went along. Watching him, first on Happy Days, then on Mork & Mindy, it was more fun to watch the cast staring in awe, breaking character, as he tore the set apart dancing and jumping around them, as he exploded into dozens of personalities like an atom splitting apart over and over again. I would stay up late to watch him on the Tonight Show, because you could never predict what would come out of him. The guest chair stayed cold next to a tearing Johnny Carson, since he would stay on his feet, or almost levitate off the ground, flying from the band, to Ed McMahon and out to the audience. But it was the other Robin Williams, the actor, which is where he gave his most indelible performances that have impacted me the most as an adult. Somehow, even as early as The World According to Garp, producers and directors knew to cast him because his sadness was so tangible; it wasn’t acting. When his characters felt sorrow, you knew Robin was feeling it, and had shared in some dark times. His Dr. Sayer in Awakenings was a performance of beauty and subtlety, and as much as DeNiro’s character’s agony was the focus of the story, the pain that Williams’ Sayer exhibited, watching his patient falling apart, is what always brings me to tears. His character Parry in The Fisher King, was perhaps closest to the real Williams. A clown, a crazed lunatic on the outside, performed to cover up the voices and agony inside. When he finally falls silent and lets the truth sink in, we see he is just a child, covering up a tragic and painful secret. As his character, John Keating in Dead Poets Society said, “No matter what anybody tells you, words and ideas can change the world.” Robin Williams did just that. As long as there is the indelible record of performance, there will be Robin Williams, and he will continue to change the world, long after we’re all gone.